Birce Ozkan has designed a fashion piece that is stunning visually alone. Yet it has been tweaked with technology to become even more captivating. Dubbed the Fall Dress, it boasts a stunning ombre effect that is entirely representative of the autumn season. But Birce Ozkan has taken the Fall Dress to the next level by making the individual 'leaves' it's made up of fall off as though it were a real tree. Created for Birce Ozkan's senior thesis project for Parsons School of Design, the Fall Dress is an answer to the question, "What if garments had the ability to sense the environment just like living organisms?" 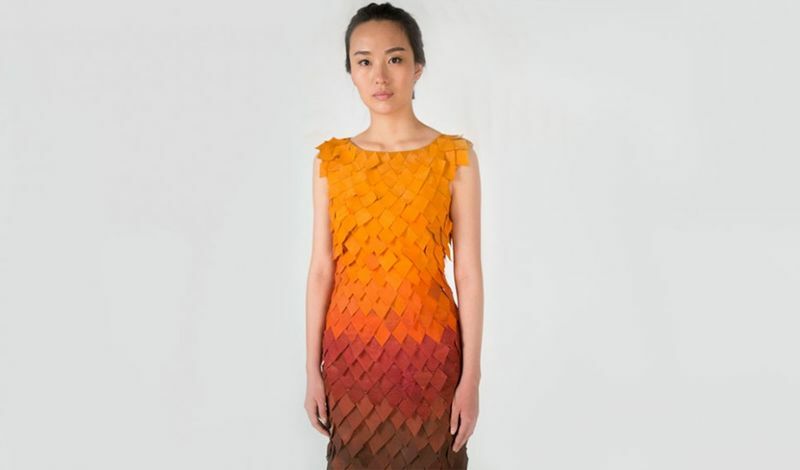 Psfk writes, "The dress uses a system that senses fading light from its surrounding to activate motors to shed leaves. The motors speed up when there is less light, which pulls the steel wires embedded in the garment and breaks off the wax that holds the leaves in place."